The Karnataka coast is an unexpected amalgam of experiences – ancient temples that have weathered kingdoms, sun-kissed beaches popular with pilgrims and tourists, and recently introduced water sports both below and beneath the waves. But there’s more. Driving along the coast offers encounters with delightfully secret beaches that are waiting to be discovered by musafirs. So pack your swimwear and sunglasses and drive from between Mangalore and Murudeshwar to enjoy these sandy pit stops. Red hued Mangalore, known for its distinctive roof tiles, is the perfect destination to get started. Hanging around the fishing villages to greet the fresh catch coming in will set the tone for this trip. As you head north, drop in at Tannir Bavi Beach and at Suratkal. Tannir Bavi is largely undeveloped except for a handful of stone benches to savour the silence from. Suratkal is less frequented, save for youngsters who want to climb the NITK lighthouse... remember though, that it’s off limits in the monsoon months. Surfers Jack Hebner and Ricky Perry took one look at the coastal village of Mulki and knew just where to set up the Mantra Surf Club. The Ashram Retreat was perfect – inconspicuous, close to local life, and with plenty of surf breaks to manoeuvre. There is no better way to sharpen your skills than by learning to take on breaks like Baba’s Left and Swami. Stretching undiscovered in the shadow of the famed Sri Krishna Temple at Udipi, the beach at Kaup is perfect for nature worshippers. Its landmark black and white lighthouse rears towards the sky from a rocky outcrop, while a clean beach unfolds languidly below it. Try your hand at different aqua activities like banana boat rides, water scooter rides or a trip to the New Clean Island, 8km into the sea. If you’re really lucky, you might be riding the waves with dolphins. Before you stretch your legs on Murudeshwar’s sands, you will be stretching your neck admiring its Temple’s Gopuram and the Shiva statue as you approach town. But the real charm of this small town is not its bustling temple courtyard, but the calm, sandy beach just in front of it that is perfect for contemplation among the waves. You can also use Murudeshwar as the base for travelling 20km into the sea for a day of scuba diving at the Netrani Islands. 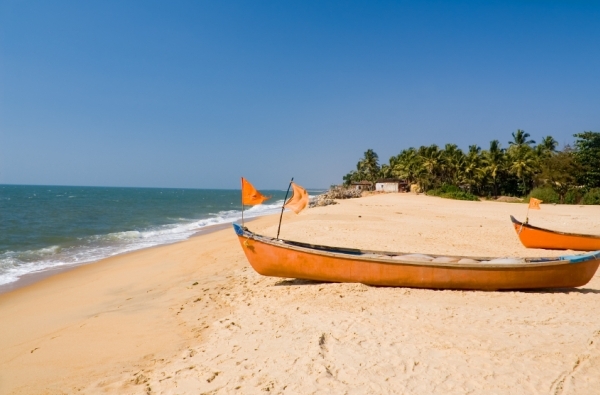 So drive off from home or fly in to Mangalore and discover some of Western India’s best beaches before the crowds do.